(3) the rising consumption also encourages consumer goods industries to expand production (Mises 2008: 558), further increasing demand for factor inputs. (4) but, according to Mises (2009 : 362–363), as scarce factor inputs are bid away by the new firms engaged in more roundabout capital projects, raising the price of factor inputs, then the mature firms producing consumer goods in the last stages of production see their total quantity of output of consumer goods fall, even as inflation in consumer goods’ prices increases, and investment continues to increase. Presumably this is the point where investment and real consumption move in opposite directions. (5) if the banks were to continue to expand the money supply indefinitely, the result will be hyperinflationary collapse of the currency, but normally banks end the process well before this (Mises 2008: 559). The boom reaches its end point when banks raise the money rate on loans, then investment falls. The capital projects that were unsustainable are folded up and liquidated, and this drives the bust (Mises 2008: 560–561; Mises 2006 : 115). The bust sees further falls in consumption and rises in saving, and liquidation of capital until bank rate and natural rate coincide and intertemporal coordination of saving and investment begins again, and investment rises. An interesting question: did Hayek agree with point (4), that at some stage of the boom investment will continue to rise as real consumption falls? Yet another question is: why does the law of demand (apparently) mysteriously stop working in the boom? Why doesn’t the relative degree of wage and price flexibility assumed in the theory (which, admittedly, is not perfect, but still reasonably strong) cause the Wicksellian natural rate to adjust and actually fall to the bank rate, as rising prices for consumer goods cause falls in the quantity demanded of consumer goods? Why don’t the rising prices of factor inputs cause falls in the quantity demanded of factors, so that investment is dampened? If I am not mistaken, John Hicks (1967) wondered the same thing, and other neoclassical economists, citing Hicks, bring up the same objection (Vasséi 2010). Vasséi (2010: 213) points out that Mises (2008: 550) assumes no significant lag between the additional consumption through rising wages and the rise in the prices of consumer goods. So a serious time lag and “sticky” consumer goods’ prices cannot account for the lack of a tendency to market clearing. Hayek’s answer, at least with respect to his version of the ABCT, was that disequilibrium in relevant product markets is not corrected because of the continuous “inflow of new money” into the system “at a given point and at a constant percentage rate” (Hayek 1969: 279). This doesn’t seem entirely convincing to me. It seems like the law of demand is asserted as a universally true law, but conveniently pushed aside when it contradicts the theory. This also illustrates how the Austrians see market economies as incredibly feeble, fragile, unstable systems, which are thrown out of balance even by fundamental institutions of capitalism like fractional reserve banking and indeed any excessive credit money creation by private sector agents. Under Austrian theory, capitalism isn’t some powerful Atlas, but is transformed into some hapless, puny weakling, liable to stumble and fall over at any time. “Daniel Kuehn on the Austrian Business Cycle Theory,” December 5, 2013. “John Hicks on Hayek’s Business Cycle Theory,” July 18, 2014. “A Candid Admission from Hayek?,” Sunday, July 20, 2014. Hayek, F. A. von. 1969. “Three Elucidations of the Ricardo Effect,” Journal of Political Economy 77.2: 274–285. Hicks, J. R. 1967. “The Hayek Story,” in J. R. Hicks, Critical Essays in Monetary Theory. Clarendon Press, Oxford. 203–215. Mises, L. von. 2006 . The Causes of the Economic Crisis and Other Essays Before and After the Great Depression, Ludwig von Mises Institute, Auburn, Ala.
Mises, L. von. 2008. Human Action: A Treatise on Economics. The Scholar’s Edition. Ludwig von Mises Institute, Auburn, Ala.
Mises, L. von. 2009 . The Theory of Money and Credit (trans. J. E. Batson), Mises Institute, Auburn, Ala.
Vasséi, Arash Molavi. 2010. “Ludwig von Mises’s Business Cycle Theory: Static Tools for Dynamic Analysis,” in Harald Hagemann, Tamotsu Nishizawa, Yukihiro Ikeda (eds.). Austrian Economics in Transition: From Carl Menger to Friedrich Hayek. Palgrave Macmillan, Basingstoke. 196–217. I am referring to the versions in Mises’ The Theory of Money and Credit (trans. J. E. Batson; Mises Institute, Auburn, Ala. 2009 ), pp. 349–366 and his “Monetary Stabilization and Cyclical Policy” (1928). It is unclear to me if there is a similar version in the original German edition the Theorie des Geldes und der Umlaufsmittel (Munich and Leipzig, 1912) or the 2nd German edition published in 1924. (1) The version in Mises’ original, German first edition the Theorie des Geldes und der Umlaufsmittel (Munich and Leipzig, 1912), and the 2nd German edition published in 1924. Then in the English translation The Theory of Money and Credit (1934; trans. H. E. Batson from 2nd German edition of 1924), J. Cape, London. And later in the 1953 version: The Theory of Money and Credit (trans. J. E. Batson; Mises Institute, Auburn, Ala. 2009 ), pp. 349–366. (2) Mises’ version in his essay “Monetary Stabilization and Cyclical Policy” (1928), available in Mises 2006 , The Causes of the Economic Crisis and Other Essays Before and After the Great Depression (Ludwig von Mises Institute, Auburn, Ala.), p. 99ff. (3) Mises’ version in Human Action: A Treatise on Economics (Yale University Press, New Haven, CT., 1949). (4) Hayek’s first version of ABCT in the first edition of Prices and Production (London, 1931), which was revised somewhat in the second edition Prices and Production (2nd edn. ; 1935), Routledge and Kegan Paul. (5) Hayek’s second version of ABCT in Profits, Interest and Investment (London, 1939). Though I will make some critical remarks here and there, I am not concerned so much with criticising the theory here, but merely reviewing it out of interest. In brief, according to Mises, when banks issue new fiduciary media in the form of credit, this tends to lower the bank rate of interest (Mises 2009 : 352). Mises’ monetary and interest rate theory is taken over from Wicksell, though Mises did not entirely agree with Wicksell on every point (Mises 2009 : 355). “Wicksell distinguishes between the natural rate of interest (natürliche Kapitalzins), or the rate of interest that would be determined by supply and demand if actual capital goods were lent without the mediation of money, and the money rate of interest (Geldzins), or the rate of interest that is demanded and paid for loans in money or money substitutes. The money rate of interest and the natural rate of interest need not necessarily coincide, since it is possible for the banks to extend the amount of their issues of fiduciary media as they wish and thus to exert a pressure on the money rate of interest that might bring it down to the minimum set by their costs. Nevertheless, it is certain that the money rate of interest must sooner or later come to the level of the natural rate of interest, and the problem is to say in what way this ultimate coincidence is brought about. Up to this point Wicksell commands assent; but his further argument provokes contradiction. According to Wicksell, at every time and under all possible economic conditions there is a level of the average money rate of interest at which the general level of commodity prices no longer has any tendency to move either upwards or downwards. He calls it the normal rate of interest; its level is determined by the prevailing natural rate of interest, although, for certain reasons which do not concern our present problem, the two rates need not coincide exactly. When, he says, from any cause whatever, the average rate of interest is below this normal rate, by any amount, however small, and remains at this level, a progressive and eventually enormous rise of prices must occur ‘which would naturally cause the banks sooner or later to raise their rates of interest.’ Now, so far as the rise of prices is concerned, this may be provisionally conceded. But it still remains inconceivable why a general rise in commodity prices should induce the banks to raise their rates of interest.” (Mises 2009 : 355). It is quite clear that Mises’ ABCT is founded on Wicksellian loanable funds theory and the unique natural rate of interest. The fact that the unique Wicksellian natural rate cannot be defined outside a one commodity world, and therefore the Wicksellian loanable funds theory underlying Mises’ ABCT is untenable, is sufficient to refute the theory (Rogers 1989: 22) on its own, but let us move on. “Assuming uniformity of procedure, the credit-issuing banks are able to extend their issues indefinitely. It is within their power to stimulate the demand for capital by reducing the rate of interest on loans, and, except for the limits mentioned above, to go so far in this as the cost of granting the loans permits. In doing this they force their competitors in the loan market, that is all those who do not lend fiduciary media which they have created themselves, to make a corresponding reduction in the rate of interest also. Thus the rate of interest on loans may at first be reduced by the credit issuing banks almost to zero. This, of course, is true only under the assumption that the fiduciary media enjoy the confidence of the public so that if any requests are made to the banks for liquidation of the promise of prompt cash redemption which constitutes the nature of fiduciary media, it is not because the holders have any doubts as to their soundness. Assuming this, the only possible reason for the withdrawal of deposits or the presentation of notes for redemption is the existence of a demand for money for making payments to persons who do not belong to the circle of customers of the individual banks. The banks need not necessarily meet such demands by paying out money; the fiduciary media of those banks among whose customers are those persons to whom the banks’ own customers wish to make payments are equally serviceable in this case. Thus there ceases to be any necessity for the banks to hold a redemption fund consisting of money; its place may be taken by a reserve fund consisting of the fiduciary media of other banks. If we imagine the whole credit system of the world concentrated in a single bank, it will follow that there is no longer any presentation of notes or withdrawal of deposits; in fact, the whole demand for money in the narrower sense may disappear. These suppositions are not at all arbitrary. It has already been shown that the circulation of fiduciary media is possible only on the assumption that the issuing bodies enjoy the full confidence of the public, since even the dawning of mistrust would immediately lead to a collapse of the house of cards that comprises the credit circulation. We know, furthermore, that all credit-issuing banks endeavour to extend their circulation of fiduciary media as much as possible, and that the only obstacles in their way nowadays are legal prescriptions and business customs concerning the covering of notes and deposits, not any resistance on the part of the public. If there were no artificial restriction of the credit system at all, and if the individual credit-issuing banks could agree to parallel procedure, then the complete cessation of the use of money would only be a question of time. It is, therefore, entirely justifiable to base our discussion on the above assumption. Now, if this assumption holds good, and if we disregard the limit that has already been mentioned as applying to the case of metallic money, then there is no longer any limit, practically speaking, to the issue of fiduciary media; the rate of interest on loans and the level of the objective exchange-value of money is then limited only by the banks’ running costs – a minimum, incidentally, which is extraordinarily low. By making easier the conditions on which they will grant credit, the banks can extend their issue of fiduciary media almost indefinitely. Their doing so must be accompanied by a fall in the objective exchange-value of money.” (Mises 2009 : 357–359). For Mises, then, the banks can “extend their issue of fiduciary media almost indefinitely” and induce a corresponding inflation. Mises next turns to the question of what happens when the bank rate is pushed below Wicksell’s unique natural rate, and what forces the two rates to equilibrate again (Mises 2009 : 359–360). “Now if the rate of interest on loans is artificially reduced below the natural rate as established by the free play of the forces operating in the market, then entrepreneurs are enabled and obliged to enter upon longer processes of production. It is true that longer roundabout processes of production may yield an absolutely greater return than shorter processes; but the return from them is relatively smaller, since although continual lengthening of the capitalistic process of production does lead to continually increasing returns, after a certain point is reached the increments themselves are of decreasing amount. Thus it is possible to enter upon a longer roundabout process of production only if this smaller additional productivity will still pay the entrepreneur. So long as the rate of interest on loans coincides with the natural rate, it will not pay him; to enter upon a longer period of production would involve a loss. On the other hand, a reduction of the rate of interest on loans must necessarily lead to a lengthening of the average period of production. It is true that fresh capital can be employed in production only if new roundabout processes are started. But every new roundabout process of production that is started must be more roundabout than those already started; new roundabout processes that are shorter than those already started are not available, for capital is of course always invested in the shortest available roundabout' processes of production, because they yield the greatest returns. It is only when all the short roundabout processes of production have been appropriated that capital is employed in the longer ones.” (Mises 2009 : 360–361). “The situation is as follows: despite the fact that there has been no increase of intermediate products and there is no possibility of lengthening the average period of production, a rate of interest is established in the loan market which corresponds to a longer period of production; and so, although it is in the last resort inadmissible and impracticable, a lengthening of the period of production promises for the time to be profitable. But there cannot be the slightest doubt as to where this will lead. A time must necessarily come when the means of subsistence available for consumption are all used up although the capital goods employed in production have not yet been transformed into consumption goods. This time must come all the more quickly inasmuch as the fall in the rate of interest weakens the motive for saving and so slows up the rate of accumulation of capital. The means of subsistence will prove insufficient to maintain the labourers during the whole period of the process of production that has been entered upon. Since production and consumption are continuous, so that every day new processes of production are started upon and others completed, this situation does not imperil human existence by suddenly manifesting itself as a complete lack of consumption goods; it is merely expressed in a reduction of the quantity of goods available for consumption and a consequent restriction of consumption. The market prices of consumption goods rise and those of production goods fall. That is one of the ways in which the equilibrium of the loan market is re-established after it has been disturbed by the intervention of the banks. The increased productive activity that sets in when the banks start the policy of granting loans at less than the natural rate of interest at first causes the prices of production goods to rise while the prices of consumption goods, although they rise also, do so only in a moderate degree, viz., only in so far as they are raised by the rise in wages. Thus the tendency towards a fall in the rate of interest on loans that originates in the policy of the banks is at first strengthened. But soon a counter-movement sets in: the prices of consumption goods rise, those of production goods fall. That is, the rate of interest on loans rises again, it again approaches the natural rate.” (Mises 2009 : 362–363). “If the banks could proceed in this manner, with businesses improving continually, could they then provide for lasting good times? Would they then be able to make the boom eternal? They cannot do this. The reason they cannot is that inflationism carried on ad infinitum is not a workable policy. If the issue of fiduciary media is expanded continuously, prices rise ever higher and at the same time the positive price premium also rises. (We shall disregard the fact that consideration for (1) the continually declining monetary reserves relative to fiduciary media and (2) the banks’ operating costs must sooner or later compel them to discontinue the further expansion of circulation credit.) It is precisely because, and only because, no end to the prolonged ‘flood’ of expanding fiduciary media is foreseen, that it leads to still sharper price increases and, finally, to a panic in which prices and the loan rate move erratically upward. Suppose the banks still did not want to give up the race? Suppose, in order to depress the loan rate, they wanted to satisfy the continuously expanding desire for credit by issuing still more circulation credit? Then they would only hasten the end, the collapse of the entire system of fiduciary media. The inflation can continue only so long as the conviction persists that it will one day cease. Once people are persuaded that the inflation will not stop, they turn from the use of this money. They flee then to ‘real values,’ foreign money, the precious metals, and barter.” (Mises 2006 : 114). Yet most business cycles do not proceed in this manner: if we look at recessions in the post-1945 era, the breakdown of the boom is not characterised by crises in inflation that set off panic. While inflation rates might well rise in the boom, nevertheless they do not rise to the levels that Mises’ theory seems to predict. “Great losses are sustained as a result of misdirected capital investments. Many new structures remain unfinished. Others, already completed, close down operations. Still others are carried on because, after writing off losses which represent a waste of capital, operation of the existing structure pays at least something.” (Mises 2006 : 115). However, as we have seen it is the inventory cycle that drives a good many recessions, which is to say, excessive accumulation of stock led to cuts in production and investment (basically, for many companies, changes in capacity utilisation) to liquidate inventories, and that in turn induces recessions. This process is a major cause of recessions, and is what drives the fall in investment, not liquidation of new, allegedly unsustainable projects. David Glasner, “Hayek on the Unsustainability of Inflation-Fed Booms,” Uneasy Money, August 30, 2012. David Glasner, “Two Problems with Austrian Business-Cycle Theory,” Uneasy Money, October 3, 2012. Robert Murphy, “David Glasner Needs to Re-Read Mises,” Free Advice, 9 October, 2012. David Glasner, “On the Unsustainability of Austrian Business-Cycle Theory, Or How I Discovered that Ludwig von Mises Actually Rejected His Own Theory,” Uneasy Money, October 10, 2012. Philip Pilkington, “Tyler Cowen and Daniel Kuehn Miss the Point of the Austrian Business Cycle Theory,” Fixing the Economists, December 6, 2013. Hayek, F. A. von, 1931. Prices and Production. G. Routledge & Sons, Ltd, London. Hayek, F. A. von, 1935. Prices and Production (2nd edn). Routledge and Kegan Paul. Mises, L. von. 1912. Theorie des Geldes und der Umlaufsmittel. Duncker & Humblot, Munich and Leipzig. Mises, L. von. 1924. Theorie des Geldes und der Umlaufsmittel (2nd edn). Duncker & Humblot, Munich. Mises, L. von. 1934. The Theory of Money and Credit (trans. H. E. Batson from 2nd German edition of 1924). J. Cape, London. Mises, L. von. 1949. Human Action. A Treatise on Economics. Yale University Press, New Haven, CT.
Mises, L. von. 1953. The Theory of Money and Credit (enlarged, new edn). Yale University Press, New Haven. Mises, L. von. 2009 . The Theory of Money and Credit (enlarged, new edn). Ludwig von Mises Institute, Auburn, Ala.
Mises, L. von. 2006 . The Causes of the Economic Crisis and Other Essays Before and After the Great Depression. Ludwig von Mises Institute, Auburn, Ala.
Mises, L. von, 2009 . The Theory of Money and Credit (trans. J. E. Batson). Mises Institute, Auburn, Ala.
A devastating range of problems with the Austrian Business Cycle Theory (ABCT) are sketched here and here, but another problem relates to what happens in the bust under the ABCT. In the bust, the ABCT says that new unsustainable capital projects initiated in the boom are liquidated: capital projects that were unsustainable are folded up and liquidated, and this drives the bust (Garrison 1997: 25). The empirical evidence, however, does not support this. A great deal of the fluctuations in output and employment during recessions are caused by changes in capacity utilisation at mature firms and businesses (Kuehn 2013: 506, citing Davis, Haltiwanger, and Schuh 1996: 56–81), often connected with the need to liquidate inventory. This is what often characterises and drives the fall in investment, not liquidation of new projects. we can see how flawed and wrong the ABCT is. Davis, S. J., Haltiwanger, J. C. and S. Schuh. 1996. Job Creation and Destruction. MIT Press, Cambridge, Mass. Garrison, R. W. 1997. “Austrian Theory of Business Cycles,” in D. Glasner and T. F. Cooley (eds. ), Business Cycles and Depressions: An Encyclopedia. Garland Pub., New York. 23–27. Kuehn, Daniel. 2013. “Hayek’s Business-Cycle Theory: Half Right,” Critical Review 25.3–4: 497–529. Philip Pilkington has an enlightening post here on Keynes’ view of the business cycle. Keynes discusses the business cycle in Chapter 22 of The General Theory of Employment, Interest, and Money (1936). “Even to-day it is important to pay close attention to the part played by changes in the stocks of raw materials, both agricultural and mineral, in the determination of the rate of current investment. I should attribute the slow rate of recovery from a slump, after the turning-point has been reached, mainly to the deflationary effect of the reduction of redundant stocks to a normal level. At first the accumulation of stocks, which occurs after the boom has broken, moderates the rate of the collapse; but we have to pay for this relief later on in the damping-down of the subsequent rate of recovery. Sometimes, indeed, the reduction of stocks may have to be virtually completed before any measurable degree of recovery can be detected. For a rate of investment in other directions, which is sufficient to produce an upward movement when there is no current disinvestment in stocks to set off against it, may be quite inadequate so long as such disinvestment is still proceeding. We have seen, I think, a signal example of this in the earlier phases of America's ‘New Deal.’ When President Roosevelt’s substantial loan expenditure began, stocks of all kinds—and particularly of agricultural products—still stood at a very high level. The ‘New Deal’ partly consisted in a strenuous attempt to reduce these stocks—by curtailment of current output and in all sorts of ways. The reduction of stocks to a normal level was a necessary process—a phase which had to be endured. But so long as it lasted, namely, about two years, it constituted a substantial offset to the loan expenditure which was being incurred in other directions. Only when it had been completed was the way prepared for substantial recovery. Recent American experience has also afforded good examples of the part played by fluctuations in the stocks of finished and unfinished goods—‘inventories’ as it is becoming usual to call them—in causing the minor oscillations within the main movement of the trade cycle. Manufacturers, setting industry in motion to provide for a scale of consumption which is expected to prevail some months later, are apt to make minor miscalculations, generally in the direction of running a little ahead of the facts. When they discover their mistake they have to contract for a short time to a level below that of current consumption so as to allow for the absorption of the excess inventories; and the difference of pace between running a little ahead and dropping back again has proved sufficient in its effect on the current rate of investment to display itself quite clearly against the background of the excellently complete statistics now available in the United States.” (Keynes 1964 : 331–332). This seems to be confirmed by modern studies of the business cycle (Knoop 2010: 18; Sorkin 1997: 569). Certainly in the golden age of capitalism (1946-early 1970s), a number of US recessions, for example, were essentially what can be called “inventory recessions”: recessions caused by businesses’ accumulating excessive inventories which they were unable to sell when the expected demand failed to materialise or demand did not grow at a sufficiently high rate. This excessive accumulation of stock led to cuts in production and investment (basically, for many companies, changes in capacity utilisation) to liquidate inventories, and that in turn induced recessions (Sorkin 1997: 569). Of course, since the 1980s the business cycle has been driven by other, perhaps more important, factors too: we have seen a return to the familiar 19th-century and pre-1933 pattern of asset bubbles financed by excessive debt, the bursting of these asset bubbles, financial crises, the collapse of business confidence, debt deflation, and so on. Keynes, J. M. 1964 . The General Theory of Employment, Interest, and Money. Harvest/HBJ Book, New York and London. Knoop, Todd A. 2010. Recessions and Depressions: Understanding Business Cycles (2nd edn.). Praeger, Santa Barbara, Calif.
Sorkin, A. L. 1997. “Recessions after World War II,” in D. Glasner and T. F. Cooley (eds. ), Business Cycles and Depressions: An Encyclopedia. Garland Pub., New York. 566–569. Of course, books on Post Keynesian economics appear every year, but over the past 8 years or so – especially after the financial crisis of 2008 – there seems to have been an embarrassment of riches in that many very good introductory and advanced books have appeared. Davidson, Paul. 2009. The Keynes Solution: The Path to Global Economic Prosperity (1st edn). Palgrave Macmillan, New York and Basingstoke. Lavoie, Marc. 2009. Introduction to Post-Keynesian Economics (2nd rev. edn.). Palgrave Macmillan, Basingstoke, UK. Skidelsky, R. J. A. 2010. Keynes: The Return of the Master (rev. and updated edn.). Penguin, London. King, J. E. 2012. The Elgar Companion to Post Keynesian Economics (2nd edn.). Edward Elgar, Cheltenham. This is the second and updated edition of this work (1st edn. King 2003) that gives excellent short essays and overviews of all major subjects in Post Keynesian economics. This is a splendid first port of call for any research, especially for the beginner. Hayes, Mark. 2006. The Economics of Keynes: A New Guide to The General Theory. Edward Elgar, Cheltenham. Tily, Geoff. 2007. Keynes Betrayed: Keynes’s General Theory, The Rate of Interest and Keynesian Economics. Palgrave Macmillan, New York. Godley, Wynne and Marc Lavoie. 2007. Monetary Economics: An Integrated Approach to Credit, Money, Income, Production and Wealth. Palgrave Macmillan, New York, N.Y.
Mitchell, William and Joan Muysken. 2008. Full Employment Abandoned: Shifting Sands and Policy Failures. Edward Elgar, Cheltenham. Davidson, Paul. 2009. John Maynard Keynes (rev. edn.). Palgrave Macmillan, Basingstoke. Hein, Eckhard and Engelbert Stockhammer (eds.). 2011. A Modern Guide to Keynesian Macroeconomics and Economic Policies. Edward Elgar, Cheltenham. A recent collection of essays on many different subjects. Keen, Steve. 2011. 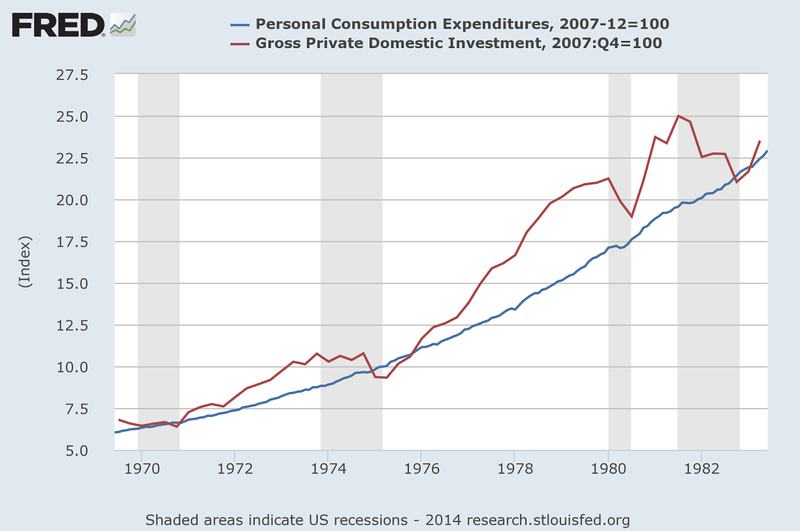 Debunking Economics: The Naked Emperor Dethroned? (rev. and expanded edn.). Zed Books, London and New York. This is the revised and updated version of Keen’s earlier work (Keen 2001). Davidson, Paul. 2011. Post Keynesian Macroeconomic Theory: Foundation for Successful Economic Policies for the Twenty-First Century (2nd edn). Edward Elgar Publishing, Cheltenham. Harcourt, G. C. and Peter Kriesler (eds.). 2013. The Oxford Handbook of Post-Keynesian Economics. Volume 1: Theory and Origins. Oxford University Press, New York. Harcourt, G. C. and Peter Kriesler (eds.). 2013. The Oxford Handbook of Post-Keynesian Economics. Volume 2: Critiques and Methodology. Oxford University Press, New York. A two volume collection of essays and advanced overviews of many different issues in Post Keynesian economics. Lavoie, Marc. 2014. Post-Keynesian Economics: New Foundations. Edward Elgar, Cheltenham. This is the newly updated and expanded version of Lavoie’s earlier work (Lavoie 1992). It runs to 680 pages, and is possibly the best and most authoritative work available. Philip Pilkington also has a forthcoming book called Reformation in Economics (more on that here). Also, Bill Mitchell and L. Randall Wray have a forthcoming book called Modern Monetary Theory and Practice (forthcoming, 2015). “A Bibliography on the History of Post Keynesian Economics (updated),” September 6, 2014. “Post Keynesian Textbooks,” July 5, 2011. “Bibliography on Post Keynesian Economics,” July 6, 2011. “Bibliography on Post Keynesian Methodology,” September 16, 2013. “Bibliography on Keynes’s Theory of Probability (Updated),” July 6, 2014. “Bibliography on Uncertainty in Post Keynesian Economics (Updated),” May 21, 2014. King, J. E. (ed.). 2003. The Elgar Companion to Post Keynesian Economics. Edward Elgar, Cheltenham, UK and Northhampton, MA. Keen, S. 2001. Debunking Economics: The Naked Emperor of the Social Sciences. Zed Books, New York and London. Lavoie, Marc. 1992. Foundations of Post-Keynesian Economic Analysis. Edward Elgar Publishing, Aldershot, UK. What was Keynes’ Political Philosophy? To cut a long story short, Keynes was a “progressive” liberal, not a conservative and not a direct supporter of the UK “Labour” party, in contrast to some people who seem to think Keynes was a conservative. Keynes opposed Marxism and communism, and his opinion of Marx’s economics was low, even scornful. Keynes called himself a “liberal” throughout his life, not a conservative, and his “liberalism” was firmly in the tradition of the progressive, interventionist type that developed in the UK from the late 19th century onwards. “Maynard avows himself a Socialist and is in favour of confiscation of wealth” (quoted in Moggridge 1992: 190). We should not be misled by the word “socialist” here. Keynes’ “socialism” at this time wasn’t Marxism, but the progressive liberalism of these years that was in favour of progressive taxation and income tax. Moreover, at this time Keynes’ radical “socialist” views were still compatible with the Liberal idea of support for free trade. Again, a close look at Keynes’ political and economic ideas in later life shows him to be firmly in the camp of what we would call a progressive, left-leaning liberal. “Now take my own case—where am I landed on this negative test? How could I bring myself to be a Conservative? They offer me neither food nor drink—neither intellectual nor spiritual consolation. I should not be amused or excited or edified. That which is common to the atmosphere, the mentality, the view of life of—well, I will not mention names—promotes neither my self-interest nor the public good. It leads nowhere; it satisfies no ideal; it conforms to no intellectual standard; it is not even safe, or calculated to preserve from spoilers that degree of civilisation which we have already attained. Ought I, then, to join the Labour Party? Superficially that is more attractive. But looked at closer, there are great difficulties. To begin with, it is a class party, and the class is not my class. If I am going to pursue sectional interests at all, I shall pursue my own. When it comes to the class struggle as such, my local and personal patriotisms, like those of every one else, except certain unpleasant zealous ones, are attached to my own surroundings. I can be influenced by what seems to me to be Justice and good sense; but the Class war will find me on the side of the educated bourgeoisie. But, above all, I do not believe that the intellectual elements in the Labour Party will ever exercise adequate control; too much will always be decided by those who do not know at all what they are talking about; and if—which is not unlikely—the control of the party is seized by an autocratic inner ring, this control will be exercised in the interests of the extreme Left Wing—the section of the Labour Party which I shall designate the Party of Catastrophe. So, for Keynes, the conservatives were a sterile road to nowhere; the Labour party was “superficially … attractive,” but on closer inspection was not satisfactory. The party that Keynes chose to identity with was the Liberal Party: “the best instrument of future progress.” The British liberal party that Keynes supported had become increasing progressive by the late 1920s. When Lloyd George became leader of liberal party for the 1929 general election, he proposed a large program of what we now call Keynesian stimulus to solve Britain’s problem of high unemployment after the disastrous return to the gold standard. At this time, Keynes was an economic adviser to the Liberal party and helped design that program. Keynes’ greatest work the General Theory and his later writings do not change this assessment. In his last years Keynes was not in sympathy with the more radical aspects of the Labour party and its economic program after it came to power after WWII, such as its nationalisations, which confirms his earlier unwillingness to associate himself with the British Labour party. On April 18, 1946, for example, Keynes, in a private conversation, attacked the Labour government’s decision to “nationalise the road-hauliers, which he regarded as an unnecessary act of regimentation” (Skidelsky 2000: 471). “On Thursday 11 April he had lunch at the Bank after the regular meeting of the court. He sat next to Henry Clay; they discussed the American loan. Keynes said that he relied on Adam Smith’s ‘invisible hand’ to get Britain out of the mess it was in, and went on: ‘I find myself more and more relying for a solution of our problems on the invisible hand which I tried to eject from economic thinking twenty years ago.’ ‘An interesting confession for our arch-planner,’ Henry Clay noted. The now-retired Montagu Norman, the recipient of Clay’s letter, wrote back: ‘About Keynes ... I think he relied on intellect, which perhaps means that he ignored the “invisible hand”, and I guess he was led astray by Harry White. But surely it is easy to arrange a loan if you ignore its repayment, and is there any hope of that, unless there is to be such an inflation across the Atlantic as will affect their claims and provide an easy way out?” (Skidelsky 2000: 470). First, the story about what Keynes said appears to be based on a letter of Henry Clay to Montagu Norman on 11 June, 1946 (Skidelsky 2000: 540, n. 43): there is no independent evidence that Keynes made such a remark. Did Clay accurately record what Keynes even said, or exaggerate its meaning somewhat? As we will see below, Keynes probably did make this remark or something to its effect, but its proper context shows us that it does not have the significance that Keynes’ critics attach to it. But suppose it were true: that Darwin recanted the Origin of Species. Would such a thing provide good grounds for rejecting the modern theory of Darwinian evolution? Not in the least. Certainly not if Darwin provided no arguments refuting his original evidence. The theory presented in Origin of Species stands by itself and its truth depends on the cogency of the evidence and arguments. Modern science has reinforced the central ideas of the Origin of Species, and whatever the dying Darwin thought is irrelevant to the modern case that can be made for its truth. Now suppose, for the sake of argument, the extreme view that Keynes really did repudiate his earlier ideas by this remark. Once again, it is the same with the central ideas of the General Theory, and certainly as refined and developed in modern Keynesian theory, which stand or fall by their own merits and the cogency of the evidence and arguments offered in support of them. In the end, it matters not one whit what Keynes thought in his last days or on his deathbed, certainly if he never provided any evidence for why he rejected his earlier theory. Theories in the natural sciences, social sciences and economics stand and fall on their merits, not on what the original inventor of them said or did on his deathbed or last few days. But, as it happens, a careful look at the context of the statement attributed to Keynes shows that it is “the American loan” obtained by the UK after WWII, the post war problems of a possible US current account surplus, an international dollar shortage after 1945, and other balance of payments difficulties that are the context of the remark (as described in Moggridge 1992: 822–825). We can see this clearly by looking at Keynes’ posthumously published paper “The Balance of Payments of the United States” (Economic Journal 56.222 : 172–187), which he had been writing in 1946 (Moggridge 1992: 822). By relying on “a solution of our problems on the invisible hand” Keynes appears to have been talking about allowing alleged long-run natural tendencies to current account and trade account equilibrium in the United States (Keynes 1946: 185) to work, whereby solving any problem of a dollar shortage in the years after 1946. “I must not be misunderstood. I do not suppose that the classical medicine will work by itself or that we can depend on it. We need quicker and less painful aids of which exchange variation and overall import control are the most important. But in the long run these expedients will work better and we shall need them less, if the classical medicine is also at work. And if we reject the medicine from our systems altogether, we may just drift on from expedient to expedient and never get really fit again. The great virtue of the Bretton Woods and Washington proposals, taken in conjunction, is that they marry the use of the necessary expedients to the wholesome long-run doctrine. It is for this reason that, speaking in the House of Lords, I claimed that ‘Here is an attempt to use what we have learnt from modern experience and modern analysis, not to defeat, but to implement the wisdom of Adam Smith.’”” (Keynes 1946: 186). Keynes’ comment to Henry Clay seems to be just a re-statement of the ideas above. And I see no reason to think that the comment of Keynes shows any rejection of the fundamental ideas of the General Theory. Keynes’ program of monetary and fiscal policy interventions to maintain aggregate demand is essentially compatible with private production of commodities and a capitalist economy. A greater concern for Adam Smith’s “invisible hand” in his last years, perhaps over balance of payments difficulties in the context of the the American loan, does not require that Keynes rejected aggregate demand management, or suddenly became some reborn advocate of complete laissez faire. Keynes, John Maynard. 1946. “The Balance of Payments of the United States,” Economic Journal 56.222 (June): 172–187. Moggridge, D. E. 1992. Maynard Keynes: An Economist’s Biography. Routledge, London. Skidelsky, R. J. A. 2000. John Maynard Keynes: Fighting for Britain 1937–1946 (vol. 3), Macmillan, London. This is one of those issues which causes critics of Keynesianism to make all sorts of ignorant statements. For example, it is frequently charged that Keynesianism ignores or neglects the investment function, and focuses too much on consumption. In reality, the investment function was seen by Keynes as the “prime mover” or “driving force” of most business cycles, and fiscal stimulus is all about (1) filling the gap created when private investment falls by means of public investment and (2) inducing private investment to rise again. A business cycle will, generally speaking, be led by a contraction in private investment spending (Arestis and Karakitsos 2013: 111; Hansen 1941: 49). Of course, consumption will also fall, usually after a lag, as private income falls, and negative feedback effects will probably reduce investment even further. Because of government countercyclical fiscal policy such as automatic stabilisers and deficit-financed fiscal stimulus (involving public investment, or social spending, R&D, a greater level of transfer payments, and so on), in the recovery we should usually see such government spending lead the upswing, with (1) consumption and then investment, or (2) investment and then consumption or (3) consumption and investment simultaneously following. 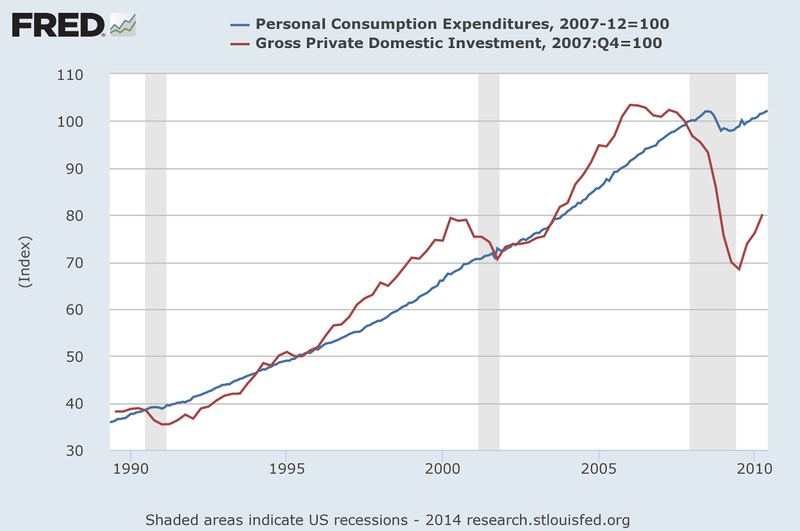 If we look at the graphs below showing an index of US personal consumption and gross private domestic investment expenditures with shaded areas showing recessions, we see that investment does indeed seem to lead the downturn in recessions. Exactly what happens in recoveries is unclear. Some Post Keynesians seem to argue that investment leads the recovery too (Arestis and Karakitsos 2013: 111), and, in regard to some US cycles before 1939, Hansen (1941: 49) reports that investment was leading the recovery. 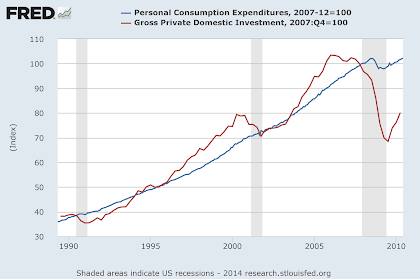 In the graphs below, it appears that consumption often seems to lead the recovery. After WWII and in the period down to the 1970s, US recessions seem to have been characterised by “inventory recessions”: they were caused by business accumulating excessive inventories which they could not sell (that is, when expected demand failed to materialise or did not grow at a sufficiently high rate), and, when these inventories were liquidated, the fall in investment was a major cause of recessions (Sorkin 1997: 569). In this sense, then, the investment decisions were obviously affected by demand for final output. Arestis, Philip and Elias Karakitsos. 2013. Financial Stability in the Aftermath of the ‘Great Recession’. Basingstoke, UK. Hansen, Alvin H. 1941. Fiscal Policy and Business Cycles. W.W. Norton & Co., New York. Sorkin, A. L. 1997. “Recessions after World War II,” in D. Glasner and T. F. Cooley (eds), Business Cycles and Depressions: An Encyclopedia. Garland Pub., New York. 566–569. Ayer, A. J. 1963. “Two Notes on Probability,” in The Concept of a Person and Other Essays. Macmillan, 188–208. Bunge, Mario. 1981. “Four Concepts of Probability,” Applied Mathematical Modelling 5: 306–312. Bunge, Mario. 1988. “Two Faces and Three Masks of Probability,” in Evandro Agazzi (ed. ), Probability in the Sciences. Kluwer Academic, Dordrecht and London. 27–50. Carnap, Rudolf. 1945. “The Two Concepts of Probability,” Philosophy and Phenomenological Research 5.4: 513–532. Keynes, John Maynard. 1931. “Ramsey as a Philosopher,” The New Statesman and Nation, 3 October. Keynes, John Maynard. 1963. “F. P. Ramsey 1903–1930,” in John Maynard Keynes, Essays in Biography (new edn.). Norton, New York. 239–254. Perry, Stephen R. 1995. “Risk, Harm, and Responsibility,” in David G. Owen (ed. ), Philosophical Foundations of Tort Law. Oxford University Press, New York. 321–346. Popper, Karl R. 1957. “The Propensity Interpretation of the Calculus of Probability, and the Quantum Theory,” in S. Körner (ed. ), Observation and Interpretation: A Symposium of Philosophers and Physicists: Proceedings of the Ninth Symposium of the Colston Research Society, held in the University of Bristol, April 1st–April 4th, 1957. Butterworths, London. 65–70. Popper, Karl R. 1959. “The Propensity Interpretation of Probability,” British Journal for the Philosophy of Science 10: 25–42. Ramsey, Frank. P. 1931. “Truth and Probability,” in Frank. P. Ramsey, The Foundations of Mathematics and Other Logical Essays (ed. by R. B. Braithwaite). Kegan Paul & Co., London. 58–100. Ramsey, Frank. P. 1989 . “Mr Keynes on Probability,” British Journal for the Philosophy of Science 40.2: 219–222. Ramsey (1922 and 1931) are criticisms of Keynes’ logical theory of probability. Keynes (1931) is his response to Ramsey. Ayer (1963) and Carnap (1945) are classic papers in philosophy of probability, and Popper (1957 and 1959) are famous statements of his “propensity” theory of probability, a modern development of which seems to be the preferred version of objective probability theory in modern philosophy (Gillies 2000: 136). Perry (1995) is a fascinating paper examining risk versus uncertainty in the context of law and litigation. Gillies, D. A. 2000. Philosophical Theories of Probability. Routledge, London. In essence, Brady argues that Shackle did not accept degrees of uncertainty, had a questionable view of inductive reasoning, and rejected the validity of even epistemic probabilities. Shackle’s view is supposedly that “there was only either a state of complete uncertainty or certainty” (Brady 2013: 2). Perhaps these criticisms of Shackle are valid, but Brady’s claims about Post Keynesianism are problematic. As I have argued here, there are Post Keynesians, even prominent ones, who recognise degrees of uncertainty. Yet another questionable assertion is that Ramsey thought that “all probabilities are real numbers between 0 and 1” (Brady 2013: 7). But Frank Ramsey seems to have accepted a “two-concept view” of probability: (1) as a concept in logic (and presumably a measure of the subjective belief of a person) and (2) as a concept in the natural sciences, namely, the frequency theory of probability (Gillies 2000: 180–181). “Let us begin at the beginning of the argument. There is a multitude of real assets in the world which constitute our capital wealth—buildings, stocks of commodities, goods in course of manufacture and of transport, and so forth. The nominal owners of these assets, however, have not infrequently borrowed money in order to become possessed of them. To a corresponding extent the actual owners of wealth have claims, not on real assets, but on money. A considerable part of this ‘financing’ takes place through the banking system, which interposes its guarantee between its depositors who lend it money, and its borrowing customers to whom it loans money wherewith to finance the purchase of real assets. The interposition of this veil of money between the real asset and the wealth owner is a specially marked characteristic of the modern world. Partly as a result of the increasing confidence felt in recent years in the leading banking systems, the practice has grown to formidable dimensions. The bank-deposits of all kinds in the United States, for example, stand in round figures at $50,000,000,000; those of Great Britain at £2,000,000,000. In addition to this there is the great mass of bonded and mortgage indebtedness held by individuals. All this is familiar enough in general terms. We are also familiar with the idea that a change in the value of money can gravely upset the relative positions of those who possess claims to money and those who owe money. For, of course, a fall in prices, which is the same thing as a rise in the value of claims on money, means that real wealth is transferred from the debtor in favour of the creditor, so that a larger proportion of the real asset is represented by the claims of the depositor, and a smaller proportion belongs to the nominal owner of the asset who has borrowed in order to buy it. This, we all know, is one of the reasons why changes in prices are upsetting.” (Keynes 1931: 169–170; reprinted in Keynes 1972: 150–158). “To sum up, there is scarcely any class of property, except real estate, however useful and important to the welfare of the community, the current money value of which has not suffered an enormous and scarcely precedented decline. This has happened in a community which is so organised that a veil of money is, as I have said, interposed over a wide field between the actual asset and the wealth owner. The ostensible proprietor of the actual asset has financed it by borrowing money from the actual owner of wealth. Furthermore, it is largely through the banking system that all this has been arranged. That is to say, the banks have, for a consideration, interposed their guarantee. They stand between the real borrower and the real lender. They have given their guarantee to the real lender; and this guarantee is only good if the money value of the asset belonging to the real borrower is worth the money which has been advanced on it. It is for this reason that a decline in money values so severe as that which we are now experiencing threatens the solidity of the whole financial structure. …. In many countries bankers are becoming unpleasantly aware of the fact that, when their customers' margins have run off, they are themselves ‘on margin.’ I believe that, if to-day a really conservative valuation were made of all doubtful assets, quite a significant proportion of the banks of the world would be found to be insolvent; and with the further progress of Deflation this proportion will grow rapidly. Fortunately our own domestic British Banks are probably at present—for various reasons—among the strongest. But there is a degree of Deflation which no bank can stand. And over a great part of the world, and not least in the United States, the position of the banks, though partly concealed from the public eye, may be in fact the weakest element in the whole situation. It is obvious that the present trend of events cannot go much further without something breaking. If nothing is done, it will be amongst the world's banks that the really critical breakages will occur. Modern capitalism is faced, in my belief, with the choice between finding some way to increase money values towards their former figure, or seeing widespread insolvencies and defaults and the collapse of a large part of the financial structure;—after which we should all start again, not nearly so much poorer as we should expect, and much more cheerful perhaps, but having suffered a period of waste and disturbance and social injustice, and a general re-arrangement of private fortunes and the ownership of wealth.” (Keynes 1931: 175–177). Furthermore, there is another point that Keynes is making, as Philip Pilkington again also argues here: for Keynes, the fall in asset prices and the rush to physical cash or liquid forms of money is a rise in liquidity preference, which can also induce destabilising effects that are worse than debt deflation. Philip Pilkington, “Keynes’ Liquidity Preference Trumps Debt Deflation in 1931 and 2008,” Fixing the Economists, February 24, 2014. Fisher, Irving. 1933. “The Debt-Deflation Theory of Great Depressions,” Econometrica 1.4: 337–357. Keynes, J. M. 1931. “The Consequences to the Banks of the Collapse of Money Values,” in J. M. Keynes, Essays in Persuasion. Macmillan, London. Keynes, J. M. 1972 . “The Consequences to the Banks of the Collapse of Money Values,” in J. M. Keynes, The Collected Writings of John Maynard Keynes. Volume IX. Essays in Persuasion. Macmillan, London. 150–158. This was part of the 2014 Rethinking Economics NYC conference, from September 12-14 at The New School, NYU and Columbia University. “We see, therefore, that rising prices and falling prices each have their characteristic disadvantage. The Inflation which causes the former means Injustice to individuals and to classes,—particularly to investors; and is therefore unfavourable to saving. The Deflation which causes falling prices means Impoverishment to labour and to enterprise by leading entrepreneurs to restrict production, in their endeavour to avoid loss to themselves; and is therefore disastrous to employment. The counterparts are, of course, also true,—namely the Deflation means Injustice to borrowers and that Inflation leads to the over-stimulation of industrial activity. But these results are not so marked as those emphasised above, because borrowers are in a better position to protect themselves from the worst effects of Deflation than lenders are to protect themselves from those of Inflation, and because labour is in a better position to protect itself from overexertion in good times than from underemployment in bad times. Thus Inflation is unjust and Deflation is inexpedient. Of the two perhaps Deflation is, if we rule out exaggerated inflations such as that of Germany, the worse; because it is worse, in an impoverished world, to provoke unemployment than to disappoint the rentier. But it is not necessary that we should weigh one evil against the other. It is easier to agree that both are evils to be shunned. The Individualistic Capitalism of today, precisely because it entrusts saving to the individual investor and production to the individual employer, presumes a stable measuring-rod of value, and cannot be efficient—perhaps cannot survive—without one. For these grave causes we must free ourselves from the deep distrust which exists against allowing the regulation of the standard of value to be the subject of deliberate decision. We can no longer afford to leave it in the category of which the distinguishing characteristics are possessed in different degrees by the weather, the birth-rate, and the Constitution,—matters which are settled by natural causes, or are the resultant of the separate action of many individuals acting independently, or require a Revolution to change them.” (Keynes 1923: 39–40). Keynes, John Maynard. 1923. A Tract on Monetary Reform. Macmillan, London. “It follows, therefore, that if labour were to respond to conditions of gradually diminishing employment by offering its services at a gradually diminishing money-wage, this would not, as a rule, have the effect of reducing real wages and might even have the effect of increasing them, through its adverse influence on the volume of output. The chief result of this policy would be to cause a great instability of prices, so violent perhaps as to make business calculations futile in an economic society functioning after the manner of that in which we live. To suppose that a flexible wage policy is a right and proper adjunct of a system which on the whole is one of laissez-faire, is the opposite of the truth. It is only in a highly authoritarian society, where sudden, substantial, all-round changes could be decreed that a flexible wage policy could function with success.” (Keynes 1964 : 269). In other words, a system in which rapid and unexpected deflation occurs will cause serious problems in a market economy and to the plans and calculations of business people. when of course mainstream neoclassical economists and heterodox economists understand this perfectly well (e.g., see Ingham 2011: 45). Of course, as Keynes thought, steady and low inflation is compatible with effective business calculation, and better than deflation for many reasons, especially if the business community, as they do now, expect a low inflation environment as the normal state of affairs. “For the sake of economic calculation all that is needed is to avoid great and abrupt fluctuations in the supply of money. Gold and, up to the middle of the nineteenth century, silver served very well all the purposes of economic calculation. Changes in the relation between the supply of and the demand for the precious metals and the resulting alterations in purchasing power went on so slowly that the entrepreneur’s economic calculation could disregard them without going too far afield. Precision is unattainable in economic calculation quite apart from the shortcomings emanating from not paying due consideration to monetary changes. The planning businessman cannot help employing data concerning the unknown future; he deals with future prices and future costs of production. Accounting and bookkeeping in their endeavors to establish the result of past action are in the same position as far as they rely upon the estimation of fixed equipment, inventories, and receivables. In spite of all these uncertainties economic calculation can achieve its tasks. For these uncertainties do not stem from deficiencies of the system of calculation. They are inherent in the essence of acting that always deals with the uncertain future.” (Mises 1998: 225). Mises was right on this one point, and Keynes would have agreed. But naturally Keynes and Mises would have disagreed on how best to achieve this aim, and on many other points of economic theory. I have shown here how Mises’ other comments about economic calculation can be subject to a Post Keynesian critique, particularly his unrealistic model, on the basis of flexible wages and prices, of how a modern market economy achieves economic coordination. But, in conclusion, it is true that violent, rapid and unexpected changes in money’s purchasing power – whether it is high inflation, hyperinflation or severe deflation – are to be avoided, so that monetary calculations of businesses about investment, costs of production and profit and loss can be meaningful: pretty much every economist understands this, and the vulgar internet Austrians have no idea what they are talking about. * I am well aware that Mises and the Austrians do not wholly subscribe to the quantity theory, but have their own criticisms of it, because of the issue of Cantillon effects and how they make the quantity theory’s assumption of a proportional relationship between money supply and price level problematic. So please don’t bother pointing this out to me! Ingham, Geoffrey. 2011. Capitalism. Polity, Cambridge. Mises, L. 1998. Human Action: A Treatise on Economics. The Scholar’s Edition. Ludwig von Mises Institute, Auburn, Ala. I have updated below my posts on probability theory, probability theory in economics and decision making theory and Keynes’ contributions to probability theory. “Davidson on ‘Reality and Economic Theory,’” July 10, 2013. “Probability and Uncertainty,” July 11, 2013. “Mises and Keynes on Probability,” July 12, 2013. “Moggridge on Keynes’s Theory of Probability,” July 14, 2013. “A Classification of Types of Probability and Theories of Probability,” July 14, 2013. “Keynes’s Interval Probabilities,” July 15, 2013. “The Reviews of Keynes’s Treatise on Probability,” July 16, 2013. “Bibliography on Keynes’s Theory of Probability,” July 19, 2013. “Fine Tuning and Probability,” July 26, 2013. “Brady and Arthmar on “Keynes, Boole and the Interval Approach to Probability,” July 29, 2013. “Post Keynesians and Degrees of Uncertainty,” July 31, 2013. “Types of Probabilities according to Keynes,” August 5, 2013. “The Epistemic Types of Probability,” May 17, 2014. “Lars P. Syll on Probability, Statistics and Economics (Updated),” May 30, 2014. “Gillies’ Philosophical Theories of Probability, Chapter 1,” August 29, 2014. “Gillies’ Philosophical Theories of Probability, Chapter 2,” August 30, 2014. “Gillies’ Philosophical Theories of Probability, Chapter 3,” August 31, 2014. “Gillies’ Philosophical Theories of Probability, Chapter 4,” September 2, 2014. “Gillies’ Philosophical Theories of Probability, Chapter 5,” September 3, 2014. “Gillies’ Philosophical Theories of Probability, Chapter 6,” September 4, 2014. “Gillies’ Philosophical Theories of Probability, Chapter 7,” September 10, 2014. “Gillies’ Philosophical Theories of Probability, Chapter 8,” September 11, 2014. “Gillies’ Philosophical Theories of Probability, Chapter 9,” September 12, 2014. David Andolfatto, “Who’s Afraid of Deflation?,” MacroMania, September 8, 2014. And what is the evidence? He notes that Japanese real per capita GDP since 2009 has risen at what seems like an unusually high rate: about a 3% annual growth rate. Certainly this is higher than the rates in the US or UK. The statistic of real per capita GDP is calculated by dividing real GDP for a given year by the population in that year. Well, according to news reports, Japan’s population has been affected by a long-run decline in population since 2004 and has one of the lowest fertility rates in the world (currently at 1.39). 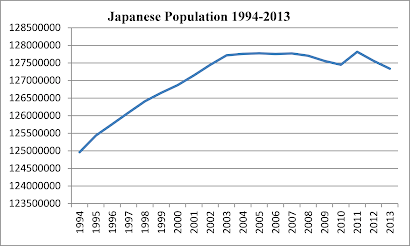 It is reported that in 2013 Japan’s population actually fell by “a record breaking 244,000” (see also here). You need only look at this graph to see the trend. 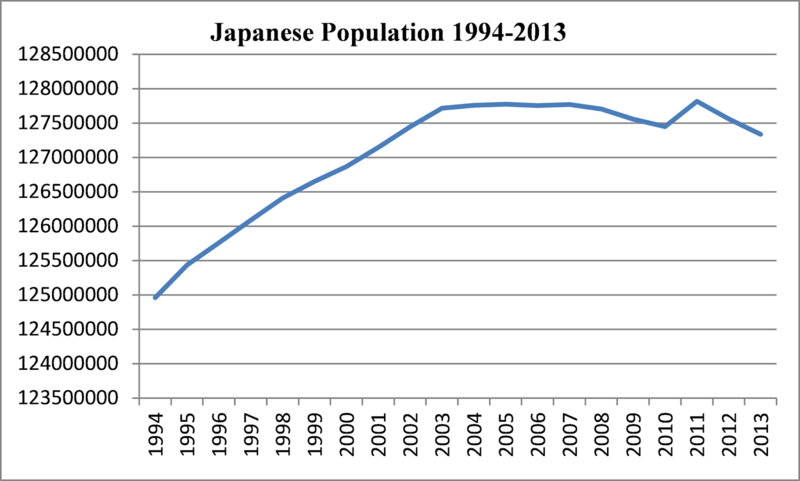 And below we have another graph of Japanese population from 1994 to 2013 (with data from the World Bank). So Japanese real GDP has continued to rise since 2004, but population peaked then started to fall. It would seem that Japan’s unusual real per capita GDP growth since 2009 is more a function of its population stagnation and decline, then above average real GDP growth. So what does this say about the merits of deflation? Not much. Japan had both fiscal stimulus and monetary intervention in 2008–2009 and later years. That was what got it out of the great recession. Another point is that Japanese deflation (at least according to World Bank figures) ended in 2012, as we can see in the graph below. 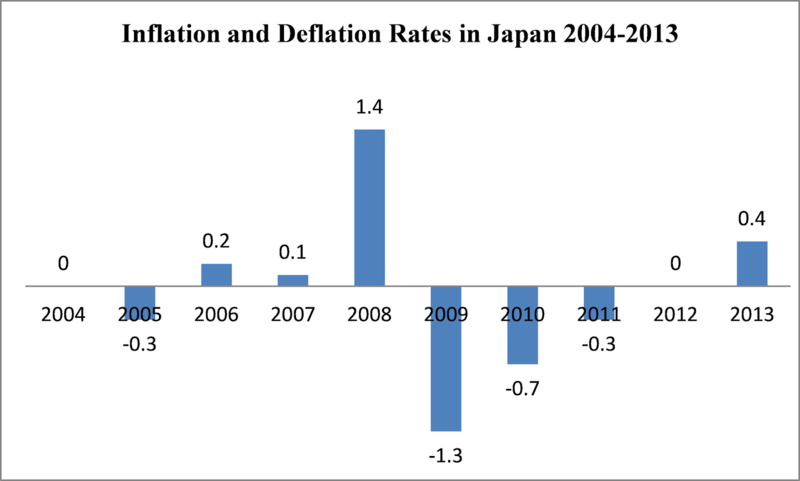 Japan had deflation in 2009, 2010 and 2011, but it was mild deflation. “Japanese Real GDP Growth, 1925–2001,” January 22, 2013. “Average Annual GDP in Japan 1980–2009,” May 22, 2012. Why is the Quantity Theory of Money Wrong and can Anything be Salvaged from it? The quantity theory of money states that when the money supply expands or contracts, this is the cause – when other variables are constant – of proportional or equal changes in the price level. In the quantity theory, the direction of causation therefore runs from the money supply to the price level, the money supply is assumed to be exogenous, and the money supply function independent in the sense described by Colin Rogers (1989: 244–245). Y = real value of the volume of all transactions entering into the value of national income (that is, goods and services). In the Cambridge approach, the variable k was held to be superior to Irving Fisher’s “velocity of circulation” concept V, because, unlike V, k is supposed to be empirically measurable. Therefore M and P are causally related, if kd and Y are constant (Thirlwall 1999). I will use the Cambridge Cash Balance Equation in what follows. Post Keynesians say that the quantity theory is not true for modern advanced capitalist economies, where money is largely endogenous. Perhaps it might be true for an economy with pure commodity money and an exogenous supply, as Colin Rogers (1989: 175, 244) argues, but even here the idea that the relationship between money supply and price level, even if kd and Y are constant, must necessarily and always be proportional in a real world economy, as compared with an analytic mathematical equation true merely by definition, seems questionable. Of course, advocates of the quantity theory will appeal to the econometric evidence. Doesn’t this prove their case? Not really. A review of the econometric evidence, as, for example, in a good study like Grauwe and Polan (2005) shows that it is a mixed bag, at best. Some studies show a proportional relationship (e.g., Vogel 1974), but others do not, but merely demonstrate a strong positive correlation (Grauwe and Polan 2005; McCandless and Weber 1995; Dwyer and Hafer 1988). Supporters of the quantity theory respond by saying that, if the data does not show a proportional relationship, then by definition kd and Y must have changed. The trouble is that this starts to render the quantity theory a tautology – the sort of mathematical or analytic a priori statement immune from empirical verification or falsification, because it is not in fact an empirical statement at all. In reality, there are deeper empirical criticisms of the quantity theory than the mixed evidence on proportionality, because the quantity theory requires certain prior assumptions for the theory to work. But, before we get to these criticisms, what can be salvaged from the quantity theory? (2) so in view of (1), it is not at all surprising that the econometric literature often finds a strong or very strong positive correlation between the money supply changes and price level changes (Grauwe and Polan 2005; McCandless and Weber 1995; Dwyer and Hafer 1988). (3) it is also true that deflations are often correlated with a falling money supply or decelerations in money supply growth. To be clear, the issue is not whether an expanding money supply is necessary for a sustained, long-run price inflation. An expanding money supply is indeed a necessary, but not sufficient, condition for price inflation. But when quantity theorists say that “inflation is always and everywhere a monetary phenomenon” (Friedman 1968: 98) they mean something more than just the basic ideas expressed above. (1) is the money supply exogenously determined, and is there an independent money supply function? (3) is the direction of causation as assumed in the quantity theory equation from left to right (that is, from the money supply to the price level)? That is to say, it is really an exogenously-determined money supply that is the fundamental cause, or driver, of price level changes? A crucial issue is (1) above: is there an exogenous, independent money supply? Is it the primary, causal origin of changes in the price level? Quantity theorists are asserting that a truly independent and exogenous money supply is the causal driver of inflation and deflation. So why do Post Keynesians reject the quantity theory? The first and most important point is that the modern money supply is endogenous. What this means is that normally broad money creation is credit-driven. That is, most money is created by private banks and its quantity is determined by the private demand for it. This is the essence of endogenous money. In an endogenous money system, even the “monetary base” is normally endogenous too, given that the central bank must accommodate the banks’ demand for high-powered money to avoid financial crises and banking panics. So what of question (1) above? Post Keynesians contend that a truly independent money supply function does not actually exist in an endogenous money world, because credit money comes into existence because it has been demanded (Rogers 1989: 244–245). So the broad money supply is not independent of money demand, but can be demand-led (Ingham 2004: 53). Next, what of question (2)? There is considerable evidence that money can never be neutral, not even in the long run. The concept of neutral money holds that changes in the money supply will only affect nominal values (e.g., money prices, nominal money wages, etc. ), not real variables (such as production, employment, and investment). Nevertheless, neoclassical economists accept the evidence that price and wage rigidity is a strong characteristic of the real world. They must then assume that prices and wages are sufficiently flexible in the long run, and that they really do adjust in the long period. The trouble is that there is little evidence for this. Most prices are mark-up prices and relatively inflexible with respect to demand changes in both the short and long run. Most capitalist economies are far from full use of resources, and even in booms businesses make use of stocks and capacity utilisation to manage demand changes, rather than changes in prices. The mysterious long-run flexibility does not seem to be visible in the data, and the long run is just a sequence of short-run periods anyway. A further complication in that nominal variables can also be found in contracts, such as debts, production orders, or forward contracts, but these are precisely the things that will not necessarily change when the money supply changes. Finally, what of question (3), concerning the direction of causation? Under an endogenous money system, the direction of causation is generally from credit demand (via business loans to finance labour and other factor inputs) to money supply increases (Robinson 1970; Davidson and Weintraub 1973). → (3) banks’ demand for more reserves (high-powered money) when they need to clear obligations. → (4) the central bank creates the needed reserves. Changes in the general price level are a highly complex result of many factors, and not some simple function of money supply. “The correlations to be explained [sc. in the relationship between money supply and real output] could be set out in quantity theory terms if the equation were read right-handed. Thus we might suggest that a marked rise in the level of activity is likely to be preceded by an increase in the supply of money (if M is widely defined) or in the velocity of circulation (if M is narrowly defined) because a rise in the wage bill and in borrowing for working capital is likely to precede an increase in the value of output appearing in the statistics. Or that a fall in activity sharp enough to cause losses deprives the banks of credit-worthy borrowers and brings a contraction in their position. But the tradition of Chicago consists in reading the equation from left to right. Then the observed relations are interpreted without any hypothesis at all except post hoc ergo propter hoc.” (Robinson 1970: 510–511). So what we can say is that – in contrast to the quantity theory – money supply changes are often the effect of changes in credit demand, production and economic activity, and not the cause of the latter phenomena. In short, money is generally the effect, not the cause. (2) prices of other factor inputs rise, and then businesses will need to obtain higher levels of credit from banks. So inflation might be driven by demand for higher wages or supply-side factors. Hence broad money supply growth rates rise in an endogenous money world which generally accommodates the demand for credit, but this rise precedes further price increases because businesses will generally raise mark-up prices to maintain profit margins at a later time, given that most firms engage in time-dependent reviews and changes of their prices at regular intervals. In extreme situations, a wage–price spiral might break out: this involves the same process as above but in a vicious circle. “Richard Werner on ‘The Quantity Theory of Credit,’” April 13, 2013. “Endogenous Money 101,” April 20, 2013. “Rochon and Rossi on the History of Endogenous Money,” May 4, 2013. “Endogenous Money under the Gold Standard,” May 19, 2013. “Some Empirical Evidence on Endogenous Money,” May 27, 2013. “Empirical Evidence on Endogenous Money,” August 10, 2013. “The Quantity Theory of Money is Wrong,” August 7, 2013. “How is New Bank Money Created?,” March 22, 2014. “Hans Albert on the Quantity Theory of Money,” March 2, 2014. “Joan Robinson on the Quantity Theory of Money,” March 3, 2014. 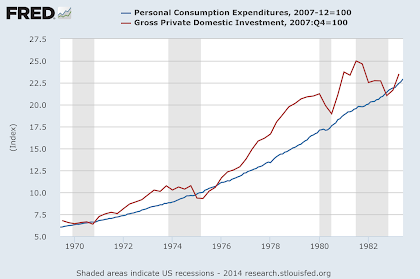 “Bob Murphy on 1970s Inflation,” April 24, 2014. “The Various Versions of the Quantity Theory,” September 12, 2014. Davidson, Paul and Sidney Weintraub. 1973. “Money as Cause and Effect,” The Economic Journal 83.332: 1117–1132. Dwyer, G. P. and R.W. Hafer. 1988. “Is Money Irrelevant?,” Federal Reserve Bank of St. Louis Review 70: 3–17. Friedman. M. 1963. Inflation: Causes and Consequences. Asia Publishing House, New York. Friedman, M. 1968. “Inflation: Causes and Consequences,” in M. Friedman, Dollars and Deficits. Prentice-Hall, Englewood Cliffs, NJ. Grauwe, P. De and M. Polan. 2005. “Is Inflation Always and Everywhere a Monetary Phenomenon?,” Scandinavian Journal of Economics 107: 239–259. Ingham, G. 2004. The Nature of Money. Polity, Cambridge, UK and Malden, MA. Kaldor, N. 1970. “The New Monetarism,” Lloyds Bank Review (July): 1–17. McCandless, G. T. and W. E. Weber. 1995. “Some Monetary Facts,” Federal Reserve Bank of Minneapolis Quarterly Review 19.3: 2–11. Moore, B. 2003. “Endogenous Money,” in J. E. King (ed. ), The Elgar Companion to Post Keynesian Economics. Edward Elgar, Cheltenham. 117–121. Robinson, Joan. 1970. “Quantity Theories Old and New: Comment,” Journal of Money, Credit and Banking 2.4: 504–512. Rogers, Colin. 1989. Money, Interest and Capital: A Study in the Foundations of Monetary Theory. Cambridge University Press, Cambridge. Thirlwall, A. P. 1999. “Monetarism,” in P. Anthony O’Hara (ed. ), Encyclopedia of Political Economy: L–Z. Routledge, London and New York. 750–753.